Fascia boards are boards or other flat pieces of material covering the ends of rafters or other fittings. Also known simply as fascias, the boards are load-bearing so that concrete roof tiles, slates or other roofing materials can rest directly on top of them. 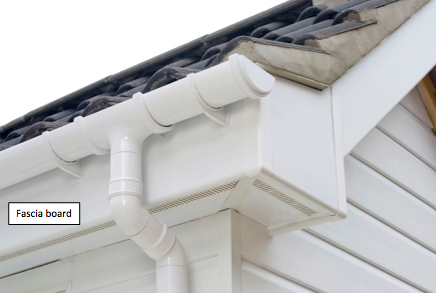 The weight exerted on fascia boards can be even heavier when there is snow loading and where guttering is fixed to it, making it imperative to select the correct depth and thickness of fascia to meet the design requirements. To help select the correct fascia board you need to consider its depth, the thickness of the board and the rafter spacing to which it will be fixed. Other design considerations will be the appearance of the board. For example, you may want a bullnose fascia board, square edge fascia board or an ornate edged fascia board. Often colour and surface finish is a design consideration as well. Shown below are some examples of UPVC fascia boards. Be aware that people often misspell the word for fascia boards being fasia boards or facia boards.